RIO GRANDE, Ohio — The University of Rio Grande women’s basketball program completed another memorable chapter in the program’s storied history this past season behind the talent of two local hardwood standouts – Morgan Daniels, a 2011 graduate from Gallia Academy High School, and Brooke Marcum, a 2011 graduate from River Valley High School. Both athletes played integral roles in the record-setting accomplishments of head coach David Smalley’s squad during the 2014-15 season. The RedStorm championed in their inaugural season in the Kentucky Intercollegiate Athletic Conference (KIAC), posting a 13-1 record in conference play en route to a national tournament berth. After a loss to Point Park University in their KIAC opener, the RedStorm went through a recommitment process, which ignited a program-record 16 consecutive wins spanning from January 10th to February 24th. The RedStorm continued its championship season by earning a bid to participate in the 2015 NAIA Division II National tournament in Sioux City, Iowa – the program’s sixth national tournament appearance. Marcum and Daniels helped guide Rio to an impressive 25-8 season, which ended in a seven-point loss to eventual national semifinalist Hastings (Neb.) College. As a senior at Gallia Academy High School, Daniels was recruited to Rio to play volleyball for head coach Billina Donaldson and basketball for Smalley. She played two seasons of volleyball as a weak side hitter and finished with 57 blocks for her career. During her freshman year, RedStorm volleyball went 21-15 and the following year garnered a 21-10 overall record in the highly-competitive Mid-South Conference (MSC). Daniels earned All-MSC Scholar Athlete honors both years of her volleyball career. After just one season of playing on the junior varsity level of the women’s hoops program, Daniels proved her worth on the court and joined the varsity ranks. Throughout her career at Rio, she was thought of as a leader both on and off the court. Late in her junior year, Daniels suffered an apparent career-ending knee injury. However, her determination and work ethic serve her well and she rehabbed her way back onto the court for an exciting senior season. Daniels proved to be one of the main reasons for the overall success of Rio’s inside game, Smalley said. “She was a strong rebounder, a solid interior player, and relentless defender who led the team in taking charges and used a variety of post moves to score around the basket,” he said. Daniels started five games for the RedStorm, but her strength was in coming off the bench and maintaining the team’s strong post play. Other KIAC coaches remarked that Daniels even elevated the level of the inside game when she took over. Daniels closed out her career by averaging 6.5 points per game and pulling down 4.8 rebounds per game in her senior season. Daniels, a Middle School Math and Science major, loves children and plans to teach and coach when she completes her degree. Daniels is the daughter of Gwen and Arthur Daniels of Rio Grande, Ohio. During Brooke Marcum’s senior year at River Valley High School, Smalley liked what he saw. Marcum signed a letter-of-intent to attend Rio Grande, but had to redshirt her first year. She became disenchanted with both school and basketball after the fall semester and walked away from a full basketball scholarship. Over the next six months, she regained her passion for the classroom and basketball court. During the 2013-14 season, Marcum statistically proved to be the frontrunner for MSC Freshman of the Year, averaging 9.4 points and pulling down 8.7 rebounds per game on an 18-win team. 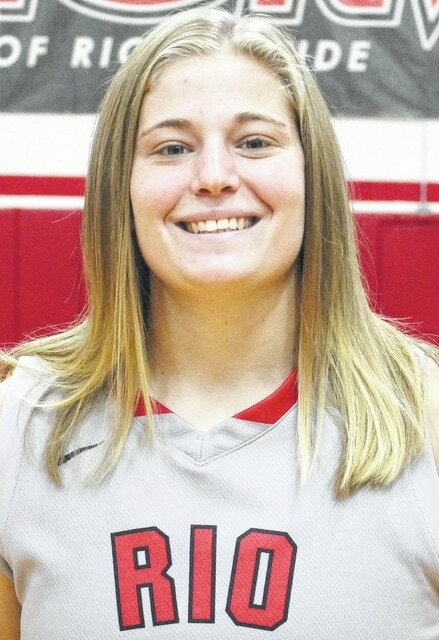 “Brooke played with passion and a purpose to prove to herself and others what she was capable of doing in the classroom and on the basketball court,” Smalley said. During the 2014-15 season, Marcum earned Player of the Week Honors in the KIAC and tied the single-game school record by grabbing 23 rebounds against Point Park University. Three games later, she tied the NAIA Division II single-season high for an individual – and set a new school record – by ripping down 27 rebounds against Indiana University-East. Marcum averaged 8.6 points per game, while pulling down 11.2 rebounds. She started 29 games as a sophomore and shot 55 percent from the field and will enter her junior year in 2015-16 on track to secure over 1,000 rebounds and score over 1,000 points for her career. Marcum, a physical education major, excels in the classroom and would love to teach and coach in the future. She is the daughter of Dawn and Sherman Marcum of Hudson, Fla. A commuter student, Marcum resides with her surrogate family of Bobby, Allison, Ana, Lexi and Nick Jeffers of Vinton, Ohio. David Smalley is the women’s basketball head coach of the University of Rio Grande.